I’m cruising down the road at 45 mph when – ka-ching! – the sound of a cash register blares out from my iPhone. It’s one of now several deal-finding apps I have installed that alert me to nearby sales at local stores. I love the functionality they provide, but I’m not thrilled with the timing. The phone buzzes some more as the alerts roll in as I coast past the mall – it’s set back from the road, and I’m passing it, not driving to it. Why is my phone bothering me with alerts when I’m just trying to focus on the traffic? Everyone talks about the dangers of texting and driving, and our Pavlovian need to respond to incoming messages while behind the wheel. But scare campaigns focused on changing user behavior can only go so far – it’s time for some OS-level intervention. I’m not ignoring the fact there are today dozens of third-party applications that can either disable texting, alert to and monitor the number of times someone is texting at the wheel, or help you avoid texting through voice features or narration. But they are not full solutions, especially on iOS which limits apps’ ability to control OS features. And they only deal with on one of many problems with behind-the-wheel use of smartphones: texting. A real solution would also eliminate all the other many distractions that smartphones bring, including the noise of apps, constantly clamoring for users’ attention. Modern-day smartphones are equipped with a range of sensors that can detect things like your location, elevation, orientation, and whether you’re walking or driving. Some apps, like the social driving app Waze, later acquired by Google, tap into smartphone sensors in an attempt to make using its app safer for drivers. 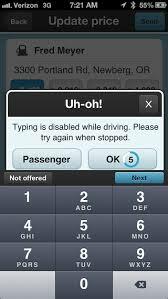 For example, Waze disabled text input when it detected a car that’s in motion. But what about the rest of the apps? Shouldn’t they, too, start thinking more responsibility about whether or not users should be able to input text at 60 mph? Couldn’t that Facebook post wait, for example? Do you really need to tweet that? However, leaving the choice up to app publishers may not be the best solution. Instead of asking app developers to reconfigure their apps for safer use, a better solution would be a system-level change: a “car mode” setting, activated when your phone is connected to the car via Bluetooth or physically plugged in. Unfortunately, the industry solution to combat the problem of distracted driving has been to redesign mobile operating systems for big-screen, hands-free usage in the car, via platforms like Apple’s CarPlay or Google’s Android Auto, for example. For older, or more capable drivers, systems like those from Apple, Google or other infotainment makers from auto manufacturers are a somewhat reasonable alternative to texting and driving. But for younger drivers, or those of us already dealing with other in-vehicle distractions – like wailing kids, backseat video players, chatty passengers, wiggling dogs, etc. – tapping screens, and chatting with Siri, however safer, should not be a focus. At the very least, the OS makers themselves have a responsibility to allow consumers without access to infotainment systems, including not just parents but also the rest of us struggling with self-control issues when it comes to our mobile devices in the car, to automate a switching over to “car mode” when we’re behind the wheel. For parents, it could be a choice within the phone’s parental controls. For others, it could be an optional setting. In addition to disabling texting and driving (hopefully auto-responding with a helpful “I’m driving right now” text back to the sender), these systems should also optionally silence phone calls (hopefully with a helpful custom voicemail greeting: “I’m driving right now, I’ll call you back!”), and disable the ability for apps to push you notifications. No more buzzing and beeping, no more ka-ching’s. When the car has been stopped for some period of time longer than a traffic light, a stream of catch-up messages could then pour in. This concept to some extent has already been dreamt up, by the way, years ago by New York designer Joey Cofone, who envisioned an iOS 7 feature that would stop texting and driving. In addition, Apple already has a patent on something like this – it has developed technology that shuts off texting and other smartphone functions when it determines a user is driving. Now it’s time to use it. Cell phones are now responsible for 1 in 4 car crashes. It’s time to make distracted driving solutions an OS industry standard.